The airport is actually about 45 minutes by road from Reykjavik… and that’s the only way there, no other infrastructure exists – no train, underground metro or tram and it’s too cold to hop on a magic carpet. My recommendation – get a Flybus return ticket – this will drop you at the central BSI bus terminal near downtown Reykjavik (where you could then take a cheaper taxi to your final destination or just walk), but you can also get a Flybus Plus ticket to take you on from there to other common destinations. The Flybus is the cheapest and arguably most comfortable option – you get WiFi on board, reclining seats and USB charging ports! It operates all year round at all times for incoming and outgoing flights. You could also take a taxi, but it’s very expensive – they do tend to accept card payments though in most taxis in Iceland, which is convenient. Alternatively you could hire a car from the airport – obviously the cheapest way to do this is to research, plan and book in advance. During snowy winter conditions the main ring road around the island is usually maintained quite well in Iceland. 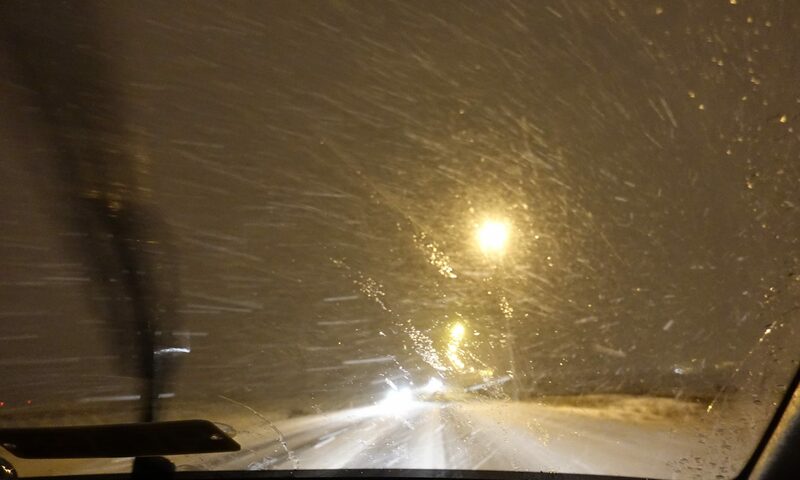 Main roads of Reykjavik are ploughed and cleared of snow, but slush remains on the roads. If you’re hiring a car in the warmer months, you’ll be fine with a normal car. And although friends who live there use their small cars through the thick of winter without much problem, if you’re going to be driving outside of Reykjavik and travelling around Iceland during winter, I would definitely suggest hiring a 4WD and being sensible with your driving. We saw several abandoned hire cars by the side of the road on our last trip to the South Coast from tourists in previous days/weeks who underestimated how severe the weather and road conditions were – stay safe. The easiest and most comfortable way to see the best of Iceland safely is to take professional tours to see the sights of Iceland. You can find tours available of varying different costs ranging from private tours, small group super jeep tours, mini bus tours and coach tours, as well as boat trips and helicopter tours and most are easy to find and check out reviews on TripAdvisor.